It’s not a #throwbackthursday, but this was a post I started some time ago from the mobile. I had it mostly written and then a bug in the app smashed the bytes into tiny bits and it never saw the light of day. August 10th, 2014 I got sick. I had not been feeling 100% when the day started, and as the race progressed I could sense something wasn’t right. No big deal, some rest and things would be fine. But they weren’t. I was really run down and had some sinus weirdness kick in. It’ll get better soon, I thought. In the grand scheme of the age of the universe, it would. In the measurement of days, weeks, and even up to months it didn’t. By mid-September I thought it would be good to seek some medical attention. I went to a non-critical emergency care place and was given a round of antibiotics. Still nothing. Crazy phlegm and exhaustion still prevailed. I saw my doctor in October. He scheduled a Pulmonary Function Test and said he suspected Asthma. Being that I could still ride a bike or unicycle for dozens of miles at a time I had my suspicions, but I’m not a doctor. So I waited 3 weeks for the Pulmonary Function Test appointment. During the test I hit the wheezing point with the phlegm fun, but the magic spray that was supposed to help if I had Asthma didn’t. So I called the doctor again, and this time it was recommended I see a specialist. It took them a month and a half to just get me on the schedule to schedule an appointment. By this time I was stable. I had settled in to that my nose was just going to perpetually run and I was going to get comfortable feeling as though I had been thrown under the bus. I finally got in to see the specialist and he (surprise) couldn’t find anything wrong. He did prescribe a nasal spray and said I’d get a card in the mail to schedule a follow up appointment. It never came. Nevermind. Sometime in late January/ early February I was using the neti-pot (a daily ritual to keep my sinuses clear and keep me off of allergy meds) when the bizarre happened. As the saline solution ran out of my nose I saw a yellow blob fall. Hmm, that looks odd. So I poked it. And then I took a closer look. And then I pulled it. And then I took a picture. It’s at the top of the post. 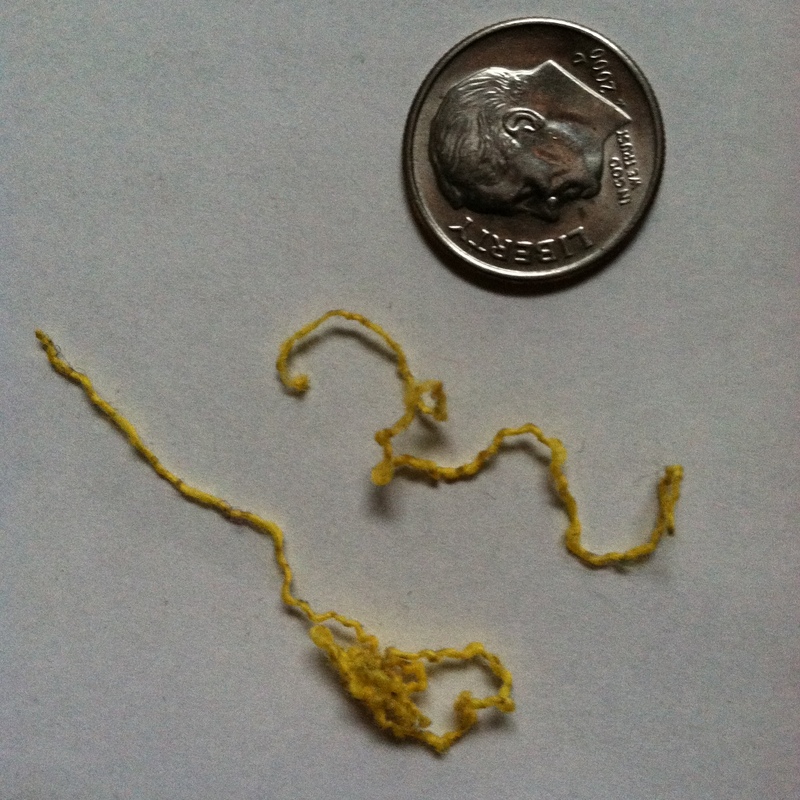 I have no idea how yellow elastic ended up in my sinuses (the dime didn’t fall out of my nose, it’s for referencing size). I don’t know of anything that exists in my world that matches it. Right around that time, my phlegm problem subsided and I started to feel less run down as well. It could be just coincidence, but even at that it’s still a fun story.